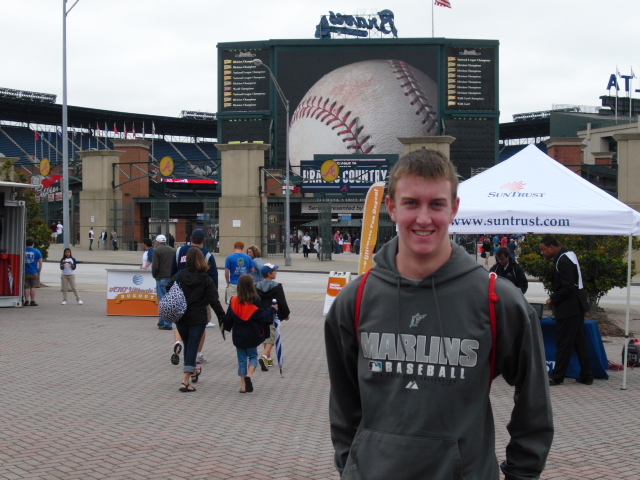 A subset of my family travelled down to Atlanta for a long weekend as the Nationals came to Turner Field. Technically speaking, this was not a “new stadium” for me; however, I was two years old the last time I saw a baseball game in Atlanta. 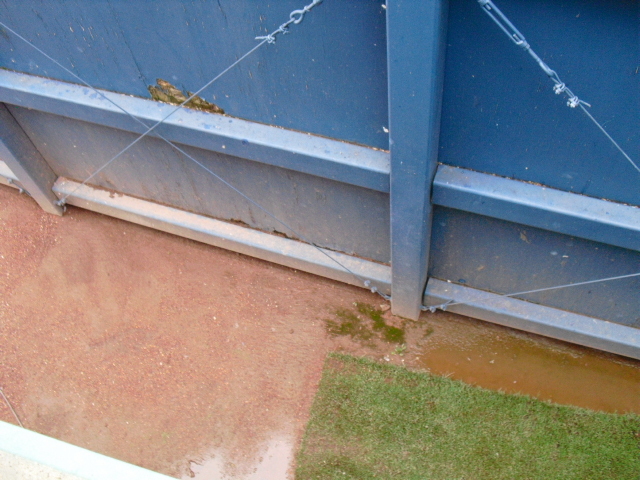 So for all the intents and purposes of this blog, I visited a new stadium on the 16th. On Friday night, we entered the stadium shortly before 5 pm for the 7:30 game. The concourse was already crowded, as were the left field seats when I made my way down there. From a ballhawking perspective, the one thing I knew for sure about Turner Field regarded the gap between the outfield wall and the seats. The large vacant space swallowed up many baseballs, and retrieval devices such as the glove trick were welcomed. Therefore, I jumped on the first opportunity that presented itself. I was standing at the centerfield end of the seats when a home run ended up in the gap somehow. Gap in left-center from where I plucked the ball. 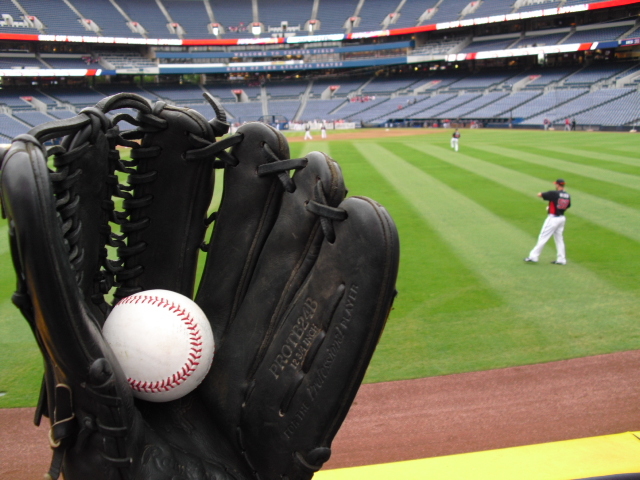 I quickly raced down to the front row and set up the glove trick, and within a few seconds I had my first ball at Turner Field. A few people around me were amused, and I was genuinely surprised when they said they had never seen it done before. Over the course of the night, I saw other glove tricks, a duct tape roll somehow rigged to pick up a ball, and a plunger-looking device. For a long time after that, the Braves were not hitting many home runs. And the few that they did hit were way too far away from me. Both the left field side and the right-centerfield side were crowded at that point, it was nothing like Nationals Park. Therefore, I had little space to maneuver since I had no intention of running over people. When the right field side opened at 5:30 or so, I hurried over so I’d have some time before it filled up. Unfortunately, the Braves lefties were not interested in hitting home runs. I believe one entered the section for the 20-30 minutes I was out there, and it went almost directly to another fan who was wearing a glove. Shortly thereafter, the Braves righties started peppering the left field seats, which were even more crowded by this point. I figured I’d at least give it a shot, so I headed back over to left field. Of course, as soon as I found a decent spot, the lefties came back up again. I don’t think this was so much bad luck as it was merely me not knowing how to play the stadium. 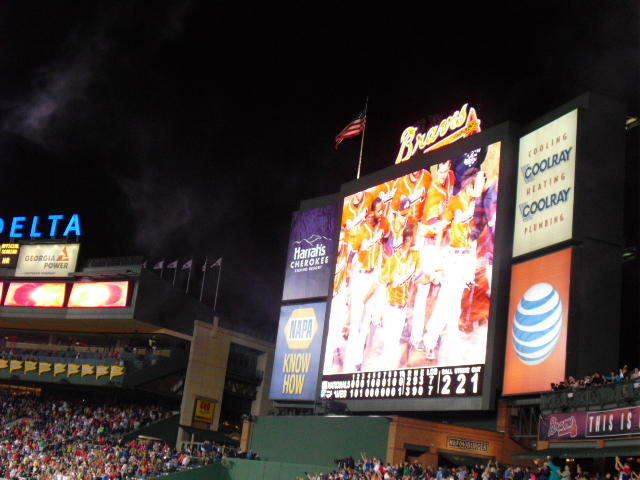 The Braves seemed to hit for a really long time, likely because the game was a 7:30 start, rather than 7:00. So they wrapped things up around 6:00 and the Nationals took the field. I was dressed neutrally at this game because generally I’m not a toss-up target unless the stadium is empty. Therefore, even though I’m a knowledgeable pseudo-Nationals fan, I still had no better luck at this point. The first group of Nats hitters stayed completely in the park. Finally, Ryan Zimmerman and Jayson Werth began connecting to left field. 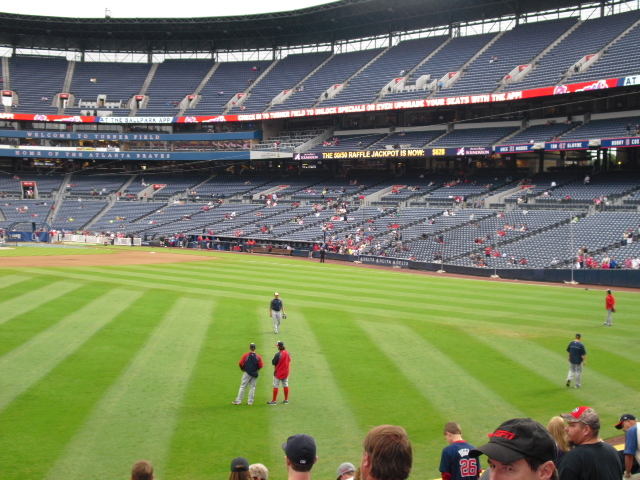 Unlike Nationals Park, the outfield seats at Turner field stretch for the entire length of left field, and bullpens take up minimal room allowing almost every home run to find people. However, since the park was so crowded, I basically had to pick a spot and hope for the best. The closest I came to catching anything was on a Jason Werth blast. I was standing in an empty row in DEEP left-center when Werth launched one just a bit to my right. I cut through the row and hoped my 6’2″ frame would be big enough to stretch for the ball headed over my head. As the ball descended towards me I heard two ladies a few rows behind me scream and duck for cover. I figured “no problem, I’ll just catch it,” but it was a tad too far. I jumped and came up just short as the ball hit the concrete next to the two seated fans in the last row. It then bounced away onto the cross-aisle. They were jokingly mad at me for not catching the ball, and I explained that I tried my best, but just came up short. The row behind me was empty as well, so if I had climbed over a row, or had just started there, I probably would have had it without issue. But luck is luck, and it wasn’t with me on Friday. Towards the end of BP, I noticed a young guy heading up the stairs with a ball in his hand that sported a commemorative logo. I stopped him and inquired about it. 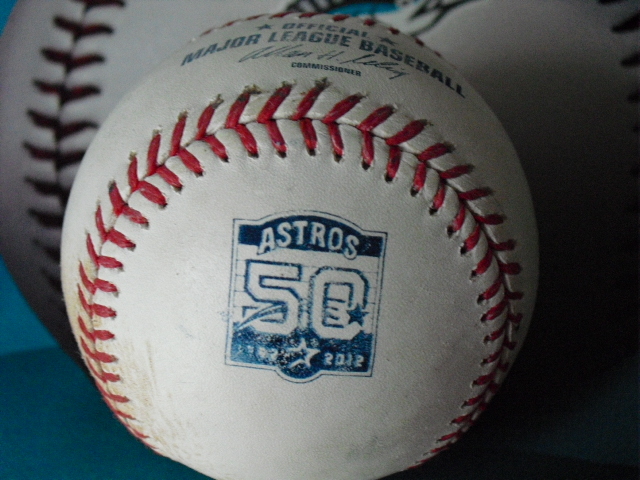 The logo was an Astros 50th anniversary ball from last season (the Astros have commemoratives this season also for their first year in the American League). All the guy knew was that it said “Astros” on it, so I explained to him the whole deal with commemorative baseballs, and he was intrigued. Houston was one of six teams to use commemoratives balls last season; the other five were the Orioles, Red Sox, Marlins, Mets, and Dodgers. Not a minute later, my little brother came down the steps and showed me his own Astros ball, one of three he caught on the day. Why did the Braves and Nationals have Astros balls? Neither team played Houston recently, nor did any of their recent opponents. It could be the same reason that three different editions of commemorative baseballs ended up in the Nationals BP buckets last season (and this season as I have since learned), and that Rawlings had a surplus of these older baseballs and sold them at a cheaper-than-usual price to MLB teams. However it ended up, I really don’t care. I’ll be happy to be able to catch commemorative baseballs any time the opportunity presents itself. Unfortunately though, there was not much opportunity for me on Friday night. Before the game began, I wandered around the main concourse and even up a level to photograph views from all over, and investigate for a Turner Field seating chart blog post, which I will hopefully compose in the near future. I must say though, Turner Field probably has the more eateries per concourse than any stadium I’ve ever been to. There was a LOT of food. As I explained in my last post, the game itself shared the spotlight with the shenanigans that occurred on the field (mainly, Bryce Harper getting plunked). And by the fourth inning, I had my Marlins sweatshirt on because it was cold! Hot-lanta was certainly NOT on this August weekend. It was overcast/raining/dreary every hour we were there, and the temperature never reached 75 degrees. I suppose it made the game more enjoyable. But I was shivering by 10:30 as the game proceeded to extra innings. I will not explain the game itself because of its meaninglessness. The Braves held a 15-game lead over the Nats at that point, and their fans just enjoyed watching the Nationals suffer. Justin Upton came through with a laser of a walk-off homer in the bottom of the tenth. The shot landed in the gap in left-center by the 380-foot mark. The place went nuts. This was the third walk-off homer I’d ever seen in person. The first one happened in the first MLB game I remember attending, in August of 2003 at Oriole Park. Tony Bautista hit an extra-inning bomb off the Devil Rays. And then in July of 2010, Ryan Zimmerman walked off on a ninth-inning homer to beat the Padres. Anyway, I immediately thought that if I got over to left field quickly enough, I’d have a chance to pluck the ball out of the gap with the glove trick. But when I got over there, security was shooing people up the steps, and did not allow me to get down to the front row. Final score: Braves: 3, Nationals: 2, Bryce Harper: -2, Braves Fans: mean. One ball at this game. First glove trick outside of Nationals Park. First ball outside Nationals Park since last July at PETCO. One cold night.